Tumor grading is a process used by doctors in order to classify the cancerous cells based on how these appear under the microscope. This way doctors can predict more accurately the survival period for each patient diagnosed with mesothelioma. Nuclear grading is the most common approach for tumor grading. The cells are grouped by the size and shape of their nuclei but other factors like nucleolus size and the rate of cell division are also important in this process. Therefore, severe nuclear atypia has been proved to reduce the survival chances while a low mitotic count (only a few cells are dividing and spreading) indicated the highest survival chances. 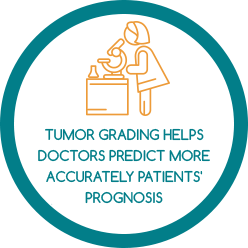 Tumor grading is a very helpful process when you need to estimate the overall survival. Predicting the recurrence of the cancer for patients treated with surgical interventions is also possible thanks to this process.